I was a guest recently on The Tablet Show with Richard Campbell and Carl Franklin, to talk about iOS development, client projects, API’s with Ruby on Rails and creating applications with interactive back ends. I think it turned out pretty well but I really can’t stand listening to my own voice, so please give it a listen and decide for your self. Thanks to Richard and Carl for having me on the show. 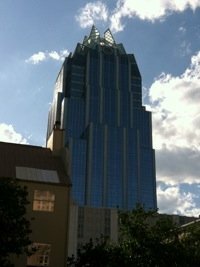 I was fortunate enough to be able to work out attending RailsConf 2012 in Austin, TX. ? This was the first time on many years that the conference was not organized by O’Reilly but rather Ruby Central, Inc. I have to go on record and say I usually avoid cities but the city of Austin is a great place and would not hesitate to return. ?The people are friendly and there is so much diversity in the city that there is something new on each corner. ?I noticed an abundance of restaurants with so many different types of food. ?I can’t say I had a single bad meal during my journey. ?Everyone I spoke with about the trip said I had to try the BBQ, and they were right?it was fantastic. Many of the sessions overfilled the room. ?This on in particular exemplifies what I’m talking about. ?I bet the fire marshal wasn’t aware of these. ?Overall the floors were pretty comfortable. It was often difficult to decide which sessions to attend, with 3 full-tracks there always seemed to be two talks during the same time slot I wanted to take. ?I usually decide which sessions to attend by how applicable they are to current work. One of my favorite sessions was by Obie Fernandez about using Redis?with Rails. ?Although the examples of the talk were from his recent startup, they were excellent and showed integrating Redis into a Rails application not to remove ActiveRecord but to compliment it. ?Obie discussed a gem he released to help the integration called redis_props along with sample code used in the talk. ?The code is clean and concise?great stuff. Another talk I found personal value in was the Semi Automatic Code Review by Richard Huang. ?Richard is the creator and maintainer of the Rails Best Practices gem. ?In the talk he discusses another related open source project called Railsbp.com which allows for your code to be reviewed when committing to Github. ?The results will be displayed on the Railsbp.com site where you can change the code right there and commit back to your repo. ?Very informative details produced from the site, GitHub allows hooks into the service and thoughtfully open sourced. ?I wasn’t aware of the site before but now I am using it regularly. The other talk which I took a lot away from was Digging Deep with ActiveSupport::Notifications by Matt Sanders. ?This talk when into great detail with many examples of using notifications in your applications. ?It is similar to the event publishing and subscriber model from other platforms such as .NET. ?Having spent many years writing .NET applications this talk brought back many memories of this pattern. ?The techniques exemplified here I had never used in Rails but do need this functionality on a new project. ? UPDATE (05/03/2012): One talk that was intended to be included here, is from Lori Olson. ?Her talk titled, Mobile Rage – What causes it & how to fix it? (Confreaks), takes the view of web application use on a mobile device from the user’s perspective and how developers can implement very simple techniques to ease the pain. ?I recommend this one highly, good stuff and some tips I was not aware of. ?I admit I have some sites that can take advantage of this. ? 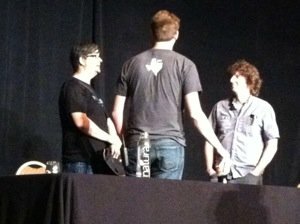 The final keynote of day one was from a non-Ruby developer, Rich Hickey, which seemed to be out of the ordinary. ?Maybe he was there to pull some Ruby developer to the Clojure world. ?It appears Rich is trying to convince these two Rubyist that LivingSocial would be better with Clojure. ?I wish I could have overheard the conversation. There were three very large, two-sided, white boards used for companies to post jobs, and they were pretty full of opportunities. ?I noticed there were far too many companies attempting to make the next Facebook or Twitter and not enough companies creating really useful applications. ?There were exceptions from what I could see, but too few. ?I remember the same thing happening around 2000 and then the bubble burst. ?Apparently we are not better from this event in history because we have not learned from it. I finally met face-to-face many friends I only knew from various social networks with lively hallway track discussions. ?I think this is the #1 reason to attend conferences. ?The materials from the talks are available everywhere and with Confreaks recording all the sessions, you can watch the show later. ?You can’t however, experience meeting new friends and seeing old ones without attending. I recommend every Rails developer attend just one of these events, well worth the time and effort. ?The next on is in Portland, OR from April 29 to May 2, 2013. I have been working diligently on a project for some time now and it’s finally available. ?My company, Still River Software, received approval from Apple last week for Palliateive Symptoms Survey to help doctors and caregivers provide better and faster care to their patients. Palliative Symptoms Survey is an application based on the Edmonton Symptom Assessment Survey (ESAS-r) which was developed to assist in the assessment of nine symptoms that are common in palliative care patients: pain, tiredness, drowsiness, nausea, lack of appetite, depression, anxiety, shortness of breath, and wellbeing There is also a blank scale for patient-specific symptoms. The application is a native iPad application written in Objective-C with a back-end using Ruby on Rails. ? Please read a little bit about the project on my company web site. I have been a huge fan of Pow to serve my Rails applications for development on my Mac. ?I wrote my love for Pow a while back and have been using it ever since, but all has not been a perfect experience along the way. ?After upgrading to the 0.3.2 version I started to have my applications appear to lock up in the browser and finally timing out. The only solution I could reliably make work was to open up Activity Monitor and kill the pow process manually. ?It worked..until the next time and I would have to do it again and again. ?It seemed like I was doing this many times a day. I did this and have not had to manually restart pow once. ?I’m not sure why the official release has not been updated to include the fix to this issue which seems to effect many users. I’m sure everyone saw this already, right? ?In case you didn’t then it’s worth a look. It amazes me (though it shouldn’t) how far a community of developers can take something vs. a software giant like Microsoft. ?It looks like open source wins against corporate. ?Sure, the results are not exactly scientific but interesting all the same. My?interview with Michael Hartl of the Ruby on Rails Tutorial series?is now live on InfoQ. ?Michael is such an interesting guy and has a diverse background ranging from physics instructor at CalTech to Ruby on Rails teacher. 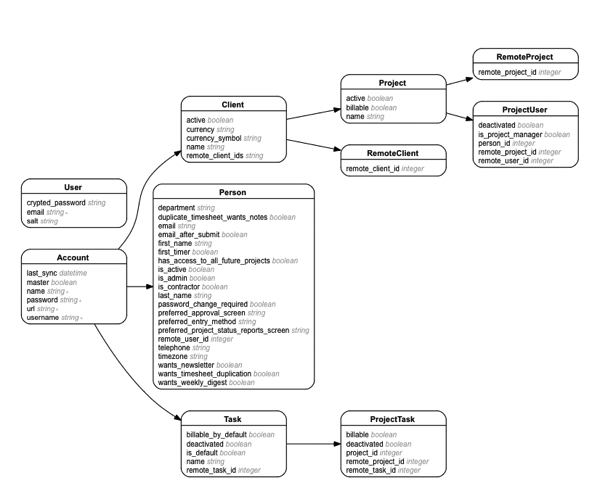 Please give Learning Ruby on Rails with Michael Hartl a read. You can find out more information about the printed version of Michael’s book Ruby on Rails 3 Tutorial: Learn Rails by Example (Addison-Wesley Professional Ruby Series) on Amazon.com. 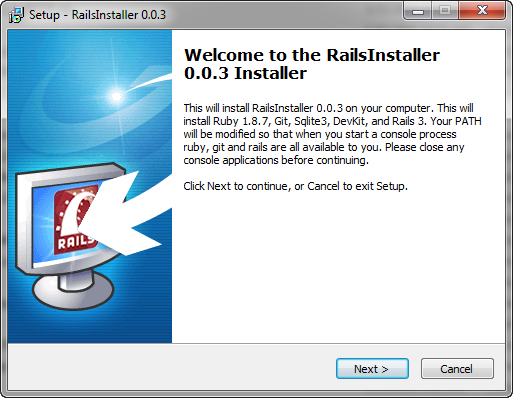 Today the great team led by Wayne Sequin (rvm fame) and Luis Lavena (RubyInstaller fame) and initiated by Dr. Nic Williams of Engine Yard released RailsInstaller. I would expect that we would see a Ruby 1.9.2 at some point but imagine there must be some technical hurdles to get beyond before it makes sense to release. The video is very clear and the installation wizard really simple, just follow the directions and keep the defaults for the best experience. The installer explains clearly what is being installed in this particular version. The default is to add to the PATH statement. 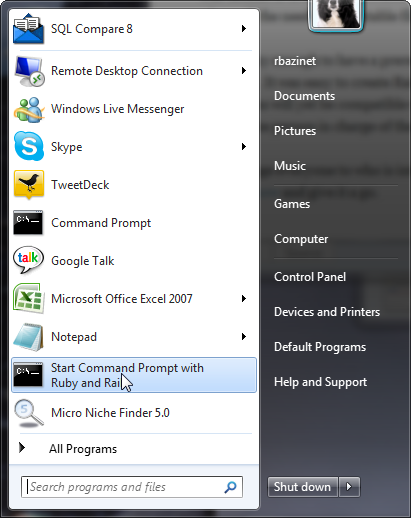 I would recommend keeping this so your system knows where to find all the needed executables. You should notice a nice shortcut to a Ruby and Rails prompt all setup to use. The Ruby version as well as the Git version are cleanly shown. You are good to go. I was lucky enough to have a prerelease build of the tool and even in a prerelease state, they guys did a great job. It was easy to create Rails apps and have them running in no time. Keep in mind that not all Ruby gems will yet be compatible with Windows. If you encounter issues you are best advised to contact the person in charge of the gem project you are trying to install. 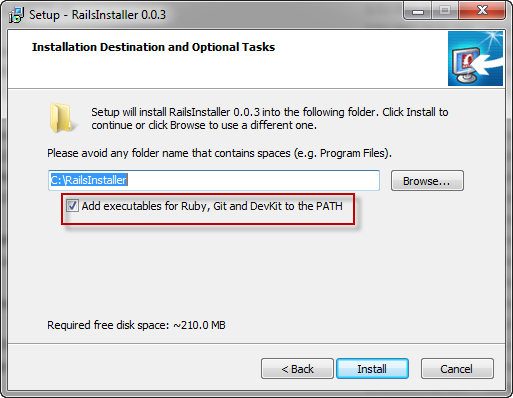 I encourage everyone to who is interested in Rails on Windows in a clean package to download the installer now and give it a go.